What are the differences between turtles and tortoises? I created my first turtle during my diploma days using clay polymer. But I draw a tortoise for my avatar profile. During my research, there are differences between turtle and tortoise. According to Chinese word, they give very specific meaning to these creatures. 乌龟 means tortoise whereas 海龟 means turtle. In Chinese word, 海 means sea. Both are reptiles with their bodies shielded by a shell, the upper part is called carapace and the lower portion called a plastron. Carapace and plastron are attached by a bridge. Though the head and limbs may be withdrawn from the shell, the whole body can never be totally detached from it. They are reclusive and shy reptiles. Turtles live in the sea whereas tortoises dwell on land. Turtle has a deeper green colour and is smaller sizes compared to tortoises. Turtles have flippers but tortoises have short and sturdy square feet that can be bent. Most tortoises are herbivores but some species prefer live food. However, turtles are omnivores which consume fruits, veggies, leafy vegetation and meat. The lifespan of tortoises are between 80 to 150 years but turtles’ lifespan ranges from 20 to 40 years. 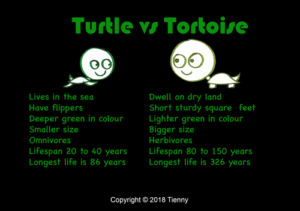 Longest living tortoise is 326 years whereas turtles are 86 years. Tortoises inhabit a variety of warm places from deserts to jungles. These are the interesting facts between the two most confused creatures. What is the origin of turtle soup?